New North Carolina State University research into wearable robotics shows how amputees wearing these devices adapted when presented with a real-world challenge: carrying a weighted backpack. The results could assist device manufacturers and clinicians expand the utility of these important devices, and could help researchers develop smarter controllers that adapt to real-world demands. 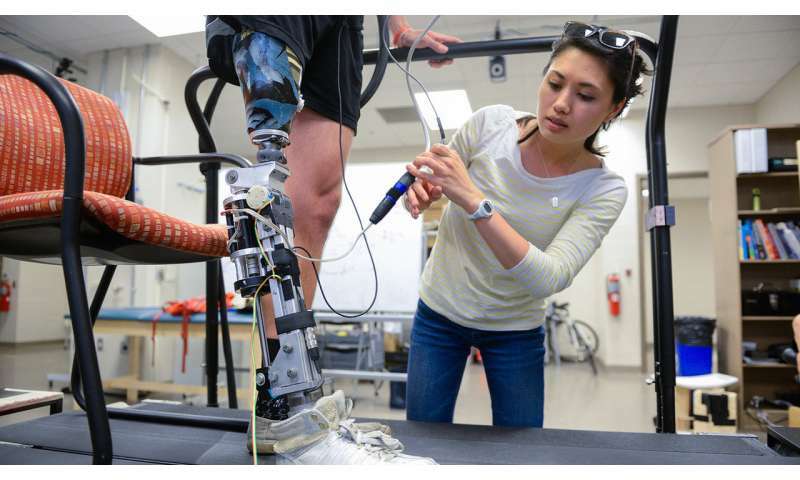 Andrea Brandt, a Ph.D. student in the NC State and University of North Carolina-Chapel Hill Joint Department of Biomedical Engineering, wanted to chart a new course of study on powered devices used to help lower-limb amputees walk. While multiple studies on the efficacy of these devices on level ground have been published, there is a paucity of work that tests these devices in more challenging real-world situations, like bearing additional weight when people carry a load - groceries or a backpack, for example. "We wanted to first understand how load affects amputees walking with normal prosthesis settings that are typically prescribed in the clinic, and then to what degree different settings could benefit them," Brandt said. "The device we tested was a powered knee prosthesis - it has a motor to actuate the knee and a fixed ankle joint. We programmed multiple settings that provided individually tuned mechanics in load-bearing and non-load-bearing conditions. We evaluated both how these settings and how carrying a load would change our study participants' gait and self-reported exertion rates." Five people of varied ages and physical attributes were recruited to take part in the study. After walking on a lab treadmill both with and without a backpack adding 20 percent of their body weight, and with or without the load-bearing power settings, the study subjects reported having more difficulties when carrying the load with the prosthetic device set at the normal setting. "Perceived exertion definitely increased, the device would hyperextend, and people relied more on their intact limb, which is already being overused," Brandt said. "Those problems were reduced when the device was set to the load-bearing setting." Interestingly, participants didn't report many difficulties with either prosthetic setting when not carrying the backpack. "Carrying a load makes your muscles contract in different ways that aren't being mimicked in prostheses today," Brandt said. "So we think load-adaptive devices could make an important difference for amputees. Imagine if the device was smart enough to automatically change the prosthesis parameters to fit any situation where we interact with the environment - carrying different amounts of load, walking on sand or grass - and how much more amputees might be able to rely on their prosthesis in their everyday life. This is the next stage of work in our lab." Brandt adds that the small study size may not reflect the entire amputee population, but instead highlights the need to consider more real-world tasks in prosthetics research. In the future, Brandt will work to address the larger issue of how to get more function out of powered devices for amputees. Finding the right control parameters and settings are part of the answer, she says, since that's what mostly determines how these devices behave. "In the long run, we want prostheses to be smarter and more functional, so amputees can rely on their prosthetic limb more, get more out of it in their daily life, get back to the activities that they love, and potentially prevent the development of secondary health issues - like osteoarthritis and back pain - that develop from having to rely more on their intact side," Brandt said.